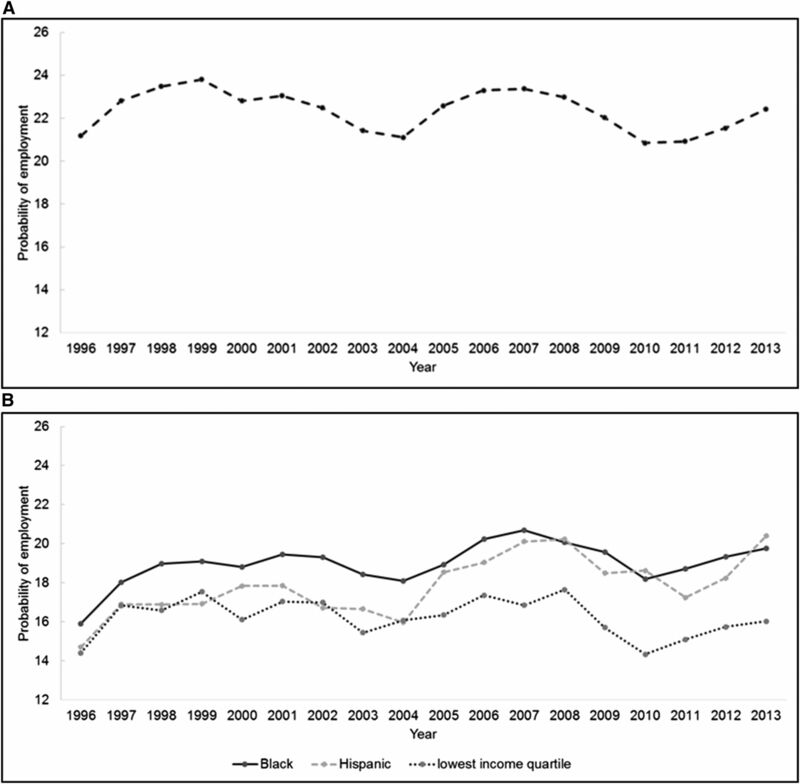 Unadjusted employment at dialysis initiation decreases slightly over time among all patients initiating dialysis, while increasing slightly among black and hispanic subpopulations. (A) Employment at dialysis initiation (all patients initiating dialysis. 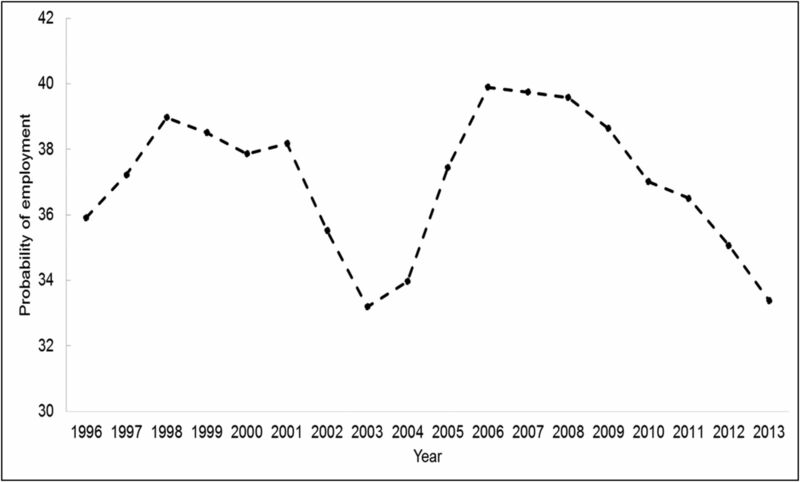 (B) Employment at the start of dialysis among vulnerable subpopulations. Employment 6 months before ESRD among all patients initiating dialysis decreased slightly over the study period. Predicted probabilities of employment at dialysis initiation increased over time after adjusting for changes in patient characteristics and employment trends in the general population. Note that predicted probabilities are derived from primary regression results. They were obtained separately for each calendar year on the basis of a scenario where all patients from the entire study population initiate dialysis in each calendar year. Estimates of the associations between calendar year of dialysis initiation and the probability of employment control for demographic and socioeconomic characteristics, patient health and comorbidities, and county-level rate of unemployment at the time of dialysis initiation. SEMs for predicted probabilities were estimated using the Δ-method. Predicted probabilities of employment 6 months before dialysis initiation and at dialysis initiation among those employed 6 months prior increase over time after adjusting for changes in patient characteristics and employment in the general population. Note that predicted probabilities are derived from primary regression results, where estimates of the association between calendar year of dialysis initiation and the probability of employment control for demographic and socioeconomic characteristics, patient health and comorbidities, and county-level unemployment rates at the time of dialysis initiation. SEMs for predicted probabilities were estimated using the Δ-method. Patients starting dialysis between 2008 and 2013 had an absolute increase of 6.6 percentage points in the adjusted probability of employment 6 months before the onset of dialysis compared with those starting dialysis between 1996 and 2001 (95% confidence interval, 6.2% to 7.0%; P<0.001). Patients who were employed 6 months before ESRD and who started dialysis between 2008 and 2013 had a 5.6 percentage points increase in the adjusted probability of employment at the start of dialysis compared with those who were employed 6 months before ESRD and who started dialysis between 1996 and 2001 (95% confidence interval, 4.9% to 6.3%; P<0.001) (Supplemental Tables 1 and 2). ↵a Standardized difference is the difference in means (or proportions) across comparison groups as a proportion of the pooled SD. A standardized difference of ≥0.1 suggests a meaningful difference in a characteristic across the two time periods being compared. Household income is the median income in a patient’s zip code. ↵b Hemoglobin has 10% missing (48,711 patients), serum albumin has 25% missing (120,879 patients), and body mass index has 3% missing (14,611 patients). eGFR is calculated from the Chronic Kidney Disease Epidemiology Collaboration equation and has <1% missing (2449 patients); 31% of patients in the cohort have at least one missing value for either hemoglobin, serum albumin, body mass index, or eGFR. ↵a Percentage change in the absolute probability of employment associated with a 1-U increase in a covariate. ↵b Change in the average of the adjusted probabilities of employment from the first 6 years (1996–2001) to the middle 6 years (2002–2007). ↵c Change in the average of the adjusted probabilities of employment from the first 6 years (1996–2001) to the last 6 years (2008–2013).